Woods is now available in cans! Thats right! MateVeza IPA, Local Honey, Morpho, Retro Pilsner and Freeze Pop are now available to pick up at all five of our locations. Grab a four pack, mix and match, or a single can to go. Look out for more beers offered by the can, as well as special projects and limited releases. Just in time for summer, Woods will start serving pizza from The Star, the latest slicery from the folks behind Little Star in San Francisco’s Mission District. The deep-dish, cornmeal-crusted options will include a meat and a veggie pie, and will be served by the slice for $7 at all five Woods locations, starting June 4. The Classic Old School includes pepperoni, black olives, mushrooms, onions, bell peppers and garlic. The NorCal is a vegetarian slice featuring mushrooms, spinach, goat cheese, red onion and garlic. Baked on-site at all Woods locations, and served with compostable plates and cutlery, they’re perfect for grab-n-go picnics or pizza parties at the bar. Plus, to wash it all down, Woods is brewing a special, limited-edition beer to be released on the same day as the pizza’s debut. Cornmeal Cream Ale combines The Star's signature cornmeal crunch with Woods's house favorite Maris Otter malt for a light, creamy beer with a zesty kick, perfect for pizza. And never fear, gauchos: the empanadas you know and love aren't going anywhere. Woods will continue serving delicious Argentine snacks from El Porteño, their loyal partner for over six years. Summer's favorite beers like MateVeza IPA, Morpho, and Retro Pils will all be available, as well as new experiments like Islay IPA and Woods's unique wine-barrel-aged Divine Origins series. So stop by all season long to toast the warmer days with old friends, new favorites, and great beer and food. Cookie Beer Returns Saturday, March 31st! Cookie Beers are back! Our annual toast to those delicious seasonal treats we love to eat, but can’t legally name — scout’s honor! — returns Friday, March 31. We’ll have cookie pairings, tasting flights, and Crowlers available. It’s Beer Week! We’re celebrating our favorite time of year with a packed calendar of special releases, parties, and events at all five Woods bars — plus, Beerunch, our famous foodie finale to the festivities, held every year at Public House. Start your day right with beer-and-food pairings of Beer in the morning? We’ll make you a believer with brunch munchies and morning-friendly beers -: mimosa-like Morpho, buzzing coffee stouts, and more. "Beer in the morning!" you say, "Blasphemy!" Well, you too will believe, as our, divine pairings that defy convention and show that the beverage of the masses is truly a beverage without boundaries and prove our favorite drink is as versatile as it is delicious. As if the mighty mollusk couldn’t be made more delicious, we’ve turned spent shells from our neighbors at Swan’s into a bonafide bivalve brewed oyster stout. A tart, tingly taste of the tropics: three different house-made, barrel-aged sours, each one its own fruit basket of flavor. Try them all and earn a special island-hopper badge of honor! The shaman returns! For the fourth year in a row, our resident apothecaries brew a series of medicinal, healing beers, using locally foraged herbs and ancient, sacred recipes. Tap the murky well of history, taste the mystic honey wines and herbal beers of our ancient ancestors. Calling all homebrewers! Take our beer and make it yours. Buy a Woods house brew and we’ll fill your carboy with wort to take home, twist, tweak, and remix to your own brewery’s unique style. We’ll start filling at 6:00pm—first come, first served! Holy hops, lupulin lovers — raise a resinous glass and toast the noble cone with a tap list packed full of the brashest and bitterest IPAs we could find. Have your dessert — and drink it too! Try a glass of our delicious tribute to Bi-Rite's fan-favorite Salted Caramel ice cream, and concoct your own brew floats with other yummy flavors of ice cream and beer! We brewed a sudsy spin on the infamous greyhound cocktail served at our neighboring watering hole Cafe Van Kleef. Try them both and earn a limited-edition badge of honor! wild yeast. Try our Sour Morpho side by side with the original, and pick your preferred pink poison! Brettanomyces! That funky, fruity, wild yeast embraced by renegade brewers, feared by the straight-laced wine world. ...Until now! Come taste our mixed fermentation beers paired with the latest cutting-edge crop of wild-fermented wines — a funked-up world of flavor! What’s better than a fresh-brewed, sticky strong, citrus-and-pine-packed double IPA? A fresh-brewed, sticky strong, citrus-and-pine-packed double IPA — infused with peat from Laphroaig barrel aging! Try your favorite Woods beers in float form with delicious scoops of ice cream from our friendly neighbors at Swensen’s. Beer and coffee go together like coconuts and toast. We honor our fellow fog-bound friends at Trouble with a java-infused stout and refreshing coconut pale. Divine Origins is our genre-bending odyssey into the unexplored worlds of natural wine, spontaneous fermentation, and barrel aging. After long collaborative work with local vintners and months hidden away in our Treasure Island barrel room, these special wine-beer hybrids blink into the daylight. Need even more of a refresh after a busy, beery week? Squeeze out those toxins in an all-levels yoga class with Atma Yoga, then rehydrate with a fizzy, friendly glass of chakra-aligning kombucha. Repent, indulgent imbibers! Exorcise your Beer Week demons with a day of purifying probiotics and our house made kombucha. Donuts and beer? Nope—donuts *in* beer. That’s right: we’ve brewed another batch of our epic Belgian Quad, flavored to pair with Bob’s infamous apple fritters. At Beer Week’s boozy finish, we might be slightly sick of foamy pints — trade those hops and malt for a palate-refreshing glass (or full flight!) of our favorite wines from near and far. Cookie Beers are back! Our annual toast to those delicious seasonal treats we love to eat, but can’t legally name — scout’s honor! — returns Friday, March 10. We’ll have cookie pairings, tasting flights, and Crowlers available — make sure to reserve yours online. Come thirsty, try all five, and take home your own limited-edition embroidered Merit Badge as proud proof of your deliciously devoted service. It's Beer Week! We're celebrating our favorite time of year with a packed calendar of special releases, parties, and events at all five (yes, five!) Woods bars — plus, Beerunch, our famous foodie finale to the festivities, held every year at Public House. And be sure to check out our newest outpost, Woods Outbound at 4045 Judah, at the edge of the earth. Calling all brewers! Help us brew a special Beer Week ale. Taste and choose ingredients, lend a hand on one of our trusty brew systems, and send our collaboration off and fermenting with our favorite fast-acting house yeasts. Both Woods breweries will be joining the fun. Come back Saturday, Feb. 18 to taste your creation! As if the mighty mollusk couldn't be made more delicious, we've turned spent shells from our neighbors at Swan's into a bonafide bivalve brewed oyster stout. We'll tap the beer Friday if you'd like to check it out early! Wine and beer; grapes and grain: incongruous partners aswirl with the spirit of wild yeast. Taste the first releases of our newest series, born of naturally fermenting fruit, aged in oak, made with magic. The shaman returns! Our resident apothecaries brew a series of medicinal, healing beers, using locally foraged herbs and ancient, sacred recipes, channeling the spirit, soothing the soul. Frighten away the frigid Frisco winter at our cozy, mountain-top ski lodge, Polk Station. Sport your chic-est ski wear, sip warming winter brews—Soft Machine, Loch Party, O Tannenbier— and send retro ski-resort cards to pals down below. Tap the murky well of history, taste the mystic honey wines and herbal beers of our ancient ancestors. Taste extra special meads from SF Mead Co. and Heidrun Meadery, paired with our very own gruits. Calling all homebrewers! Take our beer and make it yours. Buy a Woods house brew and we’ll fill your carboy with wort to take home, twist, tweak, and remix to your own brewery’s unique style. We'll start filling at 6:00pm—first come, first served! What's better than a fresh-brewed, sticky strong, citrus-and-pine-packed double IPA? A fresh-brewed, sticky strong, citrus-and-pine-packed double IPA — infused with peat from Laphroaig barrels! Beer hounds and whisky snobs, unite! A storm is coming! Toast the end of the world with a bitchin' barrel-aged Belgian beer and special screening of everyone's favorite weirdo and his foreboding furry friend. Brettanomyces! That funky, fruity, wild yeast embraced by renegade brewers, feared by the straight-laced wine world. . . . Until now! Join our resident wine expert and taste some funky house-brewed beers paired with the latest cutting-edge crop of wild-fermented wines. We team up with the dynamic talents behind Holy Mountain bar to bring you this mind-expanding journey through wild yeasts, exotic Italian citrus, potent herbs, to the very pulsing floral heart —nay, the essence — of beer. Summer's back! A refreshing reminder of warmer days ahead, our Agua Fresca beers light up the week with Latin vibes and tropical flavors. Our talent is on tap; yours takes the stage. Jokes, jams, juggling — strut your stuff, whatever it is, for praise, pints, and prizes. Come enjoy our special Beer Week ale! Every year, we kick off beer week by gathering fans, brewers, and drinkers to collaborate on a special fast-fermenting brew—made at the start of the week and tapped just seven days later. You’ll never taste beer as fresh as this! A rare foray into the dim-lit mysteries of our cellar! Taste eight special wild-fermented beers from our Treasure Island barrel room. Our fan-favorite herbal brew deserves a night all its own. Celebrate the power, the glory, and the pinkness that is Morpho! We’ll feature Dry-Hopped Morpho, Cabernet Morpho, and Morpho Noir. Passports ready? 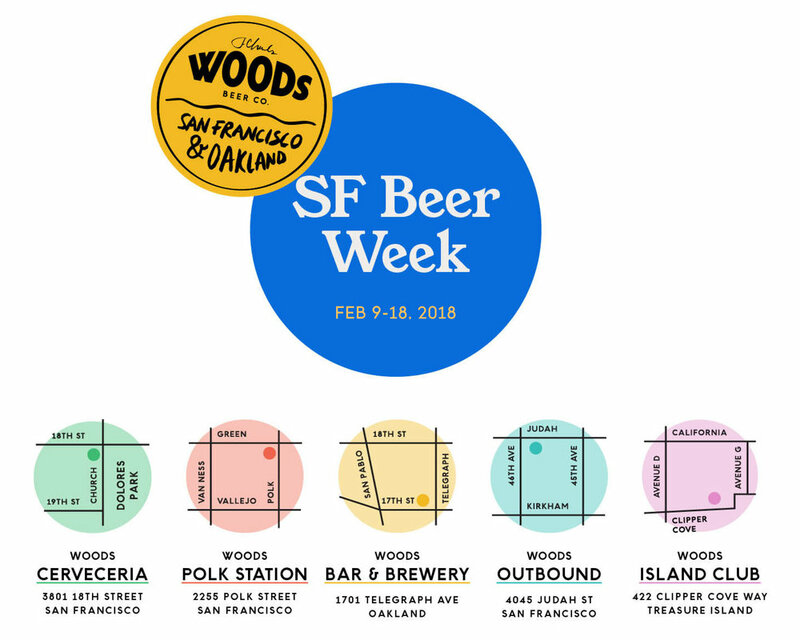 Get yours stamped at all five Woods locations as we ferry you beer-ward on a Bay-wide walkabout to Woods Cervecería, Woods Polk Station, Woods Bar & Brewery, Woods Island Club and Woods Outbound, .